← Busy Summer for WTO Trade Cases — Especially for the US & Other Major Countries — Why? Aggressive Engagement with the Global Economy. President Obama in a recent piece for THE ECONOMIST discussed globalization, technology, change & their impact on multilateral institutions, trade agreements, and immigration. He proposed various major structural changes. His description of the problem was particularly interesting and added one new element not heard before — the role of culture. He argued that global anxiety is caused by globalization & this shapes negative attitudes towards trade agreements and multilateral institutions. He then focused on the role on culture that has contributed to this general ever-growing anxiety. In particular, as manufacturing jobs disappeared so did a host of support systems, ranging from unions, local charities and church groups. This contributed to the failure to support those most of need of support. He then concluded that we must address in a positive manner these issues. But not turn back to the many forms of protectionism. A number of other articles have discussed all of this with reference to Donald Trump, growing income inequality, and implications for the passage of the TPP. All of these issues were touched upon by President Obama either explicitly or implicitly. 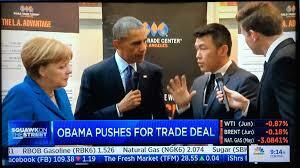 What is my take on the President’s article and the general tenor of the recent comments on the rise of trade as the premiere issue in this presidential election? The president is correct. This is truly a historical moment. Trade has never been the pivotal issue in presidential elections. The policy remedy is to recognize generally the changes brought about by globalization. But the answer, in particular, is aggressive engagement with the global economy at all levels of government and society. Not building walls of protectionism. What do they say? The best defense is a good offensive. There is no alternative. History has proven this proposition. Hufbaurer, “Trade and Trump.” Assessing Trade Agenda (Institute of Int’l Economics) 1-16 (Sept. 2016). Bart Fisher, “Trump is Herbert Hoover.” (2016). “More Wealth & Backlash on Trade.” New York Times (Sept. 28, 2016). “Obama Trade Enforcement & TPP.” New York Times (Oct. 5, 2016). “Obama — Anxiety — Globalization, Technology, Change — Institutions, Trade & Immigration.” The Economist (by Obama, 10.5.16). “How the Politics of Trade Swung so Fast.” Washington Post (Oct. 9, 2016). 1 Response to Aggressive Engagement with the Global Economy. I am a business student and I have been following the careers of some of the most influential entrepreneurs in the United States in order to help guide me on my career path. Joel Hyatt is one of the most successful entrepreneurs in the United States. I have learned a lot by following his career. He is the founder of Hyatt Legal Services, which pioneered the concept of Legal Services as a fringe benefit. Hyatt Legal Plans was the acquired by MetLife. His current venture, Globality, is building artificial intelligence tech that will enable mid-size and small businesses to play a greater role in driving the global economy. I feel that it’s going to be a huge success.